Seattle beat Glendale, Colo., 23-19 in San Diego, beating the team that beat them twice in the regular season. 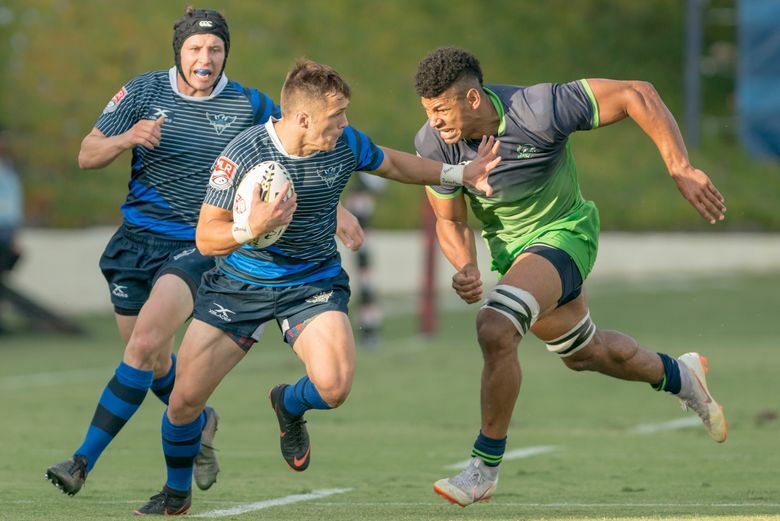 SAN DIEGO — The Seattle Seawolves finally found the right formula to beat the Glendale Raptors. And it came just in time Saturday night to win the inaugural Major League Rugby championship. The Seawolves (8-2), who lost to the Raptors twice in the regular season, rallied in the second half to win the title 23-19 at Torero Stadium on the campus of the University of San Diego. Glendale (8-2), the No. 1 seed, surged to a 19-8 lead at the start of the second half and seemed to be on its way to bringing the championship to Colorado. The Seawolves rallied for the game’s final 15 points. After Seattle’s William Rasileka scored on a try to close the deficit to 19-13, Riekert Hattingh’s long run resulted in a try to slice Glendale’s lead to 19-18. Smith’s conversion kick gave the Wolves a 20-19 lead. “I kept telling the boys it wasn’t over, not even at 19-8,’’ Rasileka said. “We all knew we could do this, but we kept making too many mistakes again today. Smith added one final three-point kick six minutes later for the final margin. “This is so huge,’’ said Seattle player-coach Phil Mack, an All-MLR performer this season. “I’m so proud of what we’ve done here. We’ve been dealing with adversity all season. We stuck together and never gave up. Seattle gained a slim 8-7 lead at halftime, but the lead could have been even bigger. Mat Turner crossed the try line with 27:55 gone for an apparent 13-7 lead, but that score was nullified by an obstruction penalty. The Seawolves opened the scoring on Peter Smith’s kick for three points with 9:08 gone. But Glendale, whose only loss before the finals was to San Diego, needed three minutes to take the lead, bulling its way over the try line for a 5-3 lead. Will Magie’s kick gave the Raptors a 7-3 lead. Seattle’s Ray Barkwill burst over the right side for five points and an 8-7 lead with 22:50 gone. Glendale seized the momentum after halftime. Less than 10 minutes into the second half, the Raptors scored to retake the lead for the second time. But the kick sailed wide right, leaving the Raptors with a 12-8 lead. That advantage surged to 17-8 when Bryce Campbell scored 56:25 into the game. Will Magie’s kick was good for a seemingly comfortable 19-8 margin. “I am so over the moon right now,’’ Smith said. “I guess the third time really is the charm.